I coauthored an essay with Zackary Berger on the problem with the industrial look and feel of the modern hospital and some ideas about how to make hospitals better able to protect their patients’ sense of self. The essay was published today in Annals of Internal Medicine. SSRN hosts the published version of the paper in which I introduce some of the ideas from my current project on Mormon history, a treatment of what sacred translation meant for founder Joseph Smith and his early followers. 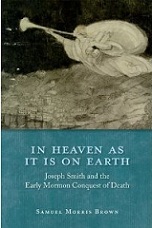 The print copy is available in the Journal of Mormon History 38:1 (Summer 2012): 51-71. In this piece at Huffington Post, I describe the severe methodological problems with a group of studies published in Science magazine, one of the top two journals in general science. In this guest post at Religion in American History, I describe the relationships between my work as a physician, medical researcher, and historian.